Cassini is probably one of our favorite spacecraft. It has brought us all sorts of fascinating pictures and data about Saturn and it’s moons. Most recently, scientists have used data from Cassini to identify at least 101 geysers on the surface of Enceladus, one of Saturn’s icy moons. Enceladus is already an interesting moon. It’s Saturn’s sixth largest moon and it’s surface is almost entirely made of ice, most of which is water ice. Enceladus has a lot of tidal stress on it as it orbits Saturn, so it helps to keep the interior warm enough for water to stay liquid. This makes Enceladus one of the prime candidates for life within our Solar System. 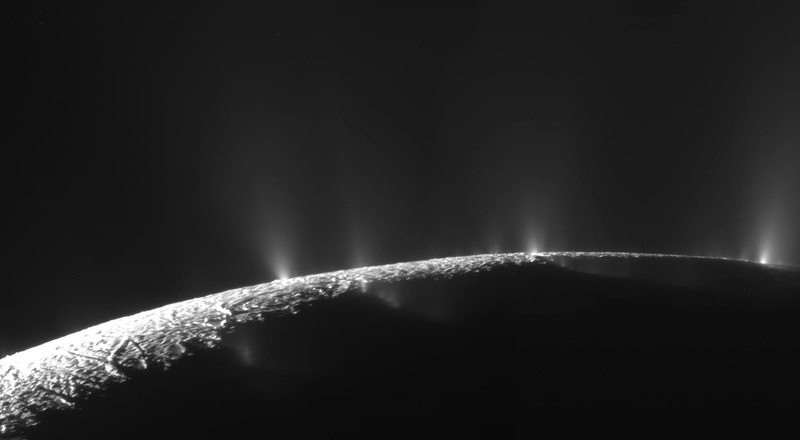 These geysers are exciting because they give us a look at Enceladus’s interior ocean without having to dig down to find it. Over six years of observation, Cassini has been monitoring geyser activity on the frozen moon. All of can be found in one of four “tiger stripe” features. These are geological ridges in the ice that are best related to plate tectonics. These ridges are thought to rub against each other due to tidal stresses exerted on the moon. This causes scientists to have two opposing ideas about how the geysers are formed. If the tiger stripes rub against each other, friction could cause pockets of the ice to melt and build pressure until the geyser erupts. This means the geysers would essentially be disconnected from the subsurface ocean and that would make scientists more sad. 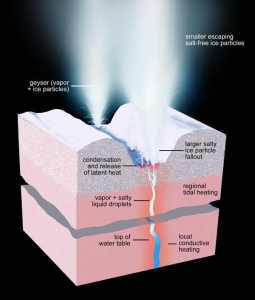 In contrast, the geysers could originate from processes taking place under Enceladus’s surface. If this was the case, when they erupted, the ice-steam would allow us to analyze the conditions of the ocean under the surface, and this would make scientists happier. This discovery may prompt future missions to Enceladus to take advantage of these geysers so we can learn more about what lies beneath the surface.